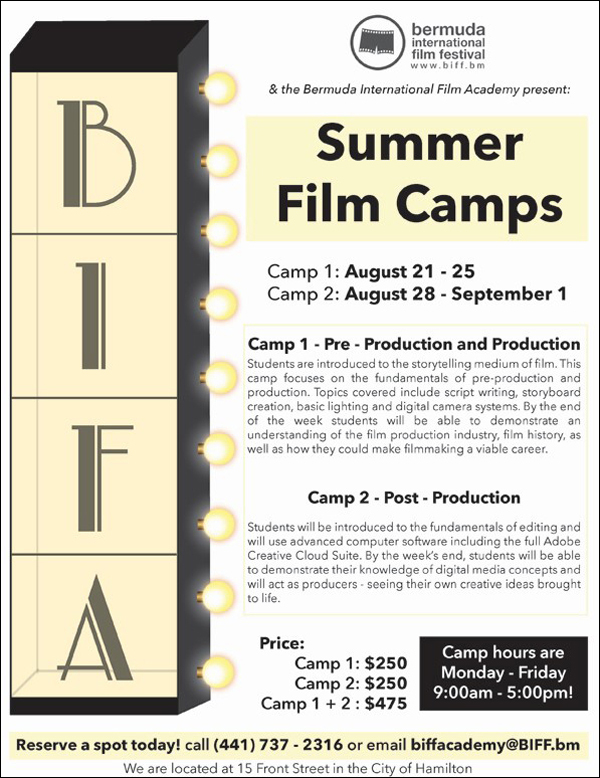 The Bermuda International Film Festival [BIFF] and Bermuda International Film Academy will be hosting Summer Film Camps from Monday, August 21 to Friday, August 25 and from Monday, August 28 to Friday, September 1st. The event poster says, “Camp 1 – Pre – Production and Production: Students are introduced to the storytelling medium of film. This camp focuses on the fundamentals of pre-production and production. “Topics covered include script writing, storyboard creation, basic lighting and digital camera systems. By the end of the week students will be able to demonstrate an understanding of the film production industry, film history, as well as how they could make filmmaking a viable career. “Camp 2 – Post – Production: Students will be introduced to the fundamentals of editing and will use advanced computer software including the full Adobe Creative Cloud Suite. By the week’s end, students will be able to demonstrate their knowledge of digital media concepts and will act as producers – seeing their own creative ideas brought to life.